Oh, Algebra - how I miss and love thee. Yeah, my kids all think I'm weird too but I can't help it. I love math!! I am especially fond of Algebra. So when the opportunity arose to review Math 911, I raised my hand and waved it back and forth very fast and was chosen. Math 911 was designed by a fellow Math lover, Professor Martin Weissman, who has taught Math for going on 49 years now. I started at the beginning with the Introductory Course. Yes, I started this one. The children were still on summer vacation and I really wanted to try this one out for myself. The software has a no frills approach to Math. It even comes with this disclaimer! It simply gives you a problem, you answer and if your answer is correct, you move on. If your answer incorrectly, you will be given more problems until you have complete mastery. I love this approach and think it is the only way to learn Math. All too often, I feel students advance on when key concepts have not be learned and then they hit a brick wall and it seems they suddenly become behind in math. When in reality, they were truly behind all along. I spent 10 minutes a day on this program. Here is a screen shot of a problem. 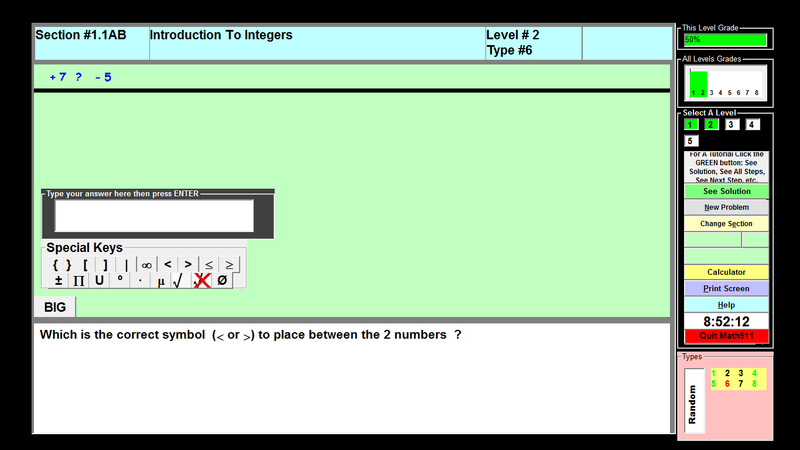 You type in the answer and if you are not correct, you can click the See Solution button to see how to work the problem. It immediately gives you the correct answer. You can also see additional screen shots of an older version of the program here. The great news is you can try out the Complete Introductory Algebra course for FREE by simply clicking on the left side at the website where it says click here in red. This is a great option to give the product a try before you buy! These pdf's include math instruction and fun cartoons too! We reviewed the Premier Version of Math 911 which includes Introductory Algebra, Intermediate Algebra (Algebra 2), College Algebra, Trigonometry, Pre Calculus, and Statistics. This version can be purchased here for $49.95 and includes all the course + free upgrades and technical support. There is also a premier password version which allows multiple students to enjoy learning too. There are also networking options available allowing you to use the program on more than one computer. All of these options are available for $49.95. Right now you can purchase Math 911 on a flash drive for only $9.95 by using the code homeschool. I do not know how long this will be available at this price so if you are interested go here now. Note: If you purchase the flash drive program, you will have to run the program from the flash drive only. One more thing that I wanted to mention that applied to our family and Math 911. I used this program for myself and I loved it but I am a math lover. I do not believe that it can be used as a stand alone program for my children though. They need more instruction than what is available using this program. I think it would be a great supplement for them to receive extra math practice. None of my children, however, inherited my love of math. Be sure to check out what my fellow crew members thought about Math 911. **Disclaimer: As a member of The Schoolhouse Review Crew, I received a free premier version download for my review. The opinions here are my honest and true evaluation.